A healthy nail grows approximately 0.1mm per day, depending ont he stable composition of the nail plate. Food, stress, pollution, sun, cold and change of season, all these elements affects the cycles of growth and health of the nail. Moreover the keratin structures are very permeable (10 times higher than skin) and to stay healthy, they need exchange with air and water vapour. When nails are covered by artificial product, they can be vulnerable to dehydration, bacterial and fungal infection. Keratin, which makes up the majority of the nail structure , allows the transmission of oxygen and water vapour to nourish the skin and kill anaerobic bacteria. Evo2 Oxygenating Base is optimized to mimic this process by facilitating the exchange of oxygen and water vapour. Even though H2O is a larger molecule than O2, it is much smaller than the larger gaps in the cured gel's microscopic structure and allows water vapour molecules to migrate through the Gel. Large gaps in the microscopic structure of the cured base allow water vapour and air permeatiion. H2O and O2 molecules migrate in and out, to and from the nail bed. Evo Base has been designed form the base up, to provide the best combination of performance and safety. It contains no organic solvents, formaldehyde, DBP or Camphor. Vitamin A and Vitamin E have been added to the base. These Vitamins will migrate to the nails after curing. Its long chain length polyurethane backbone was selected specifically to provide the flexibility and toughness necessary for product performance as well as to provide better water vapour permeation after curing. Evo Base is a Medical Grade Formulation. ISO 10993-5.
eVo2 boasts a world first medical grade formulation and oxygenating gel technology, no nasty chemicals. It is applied like a nail vanish and is as thin like a nail polish with an amazing mirror glass finish. The Gel is instantly cured (dry) with our 5 star rated LED light. eVo2 has amazing self leveling properties unlike any other base gel or gel colour on the market which provide strength and flexibility. 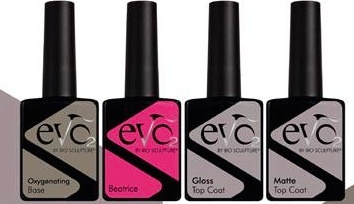 eVo2 will never comprise the health of your natural nail. 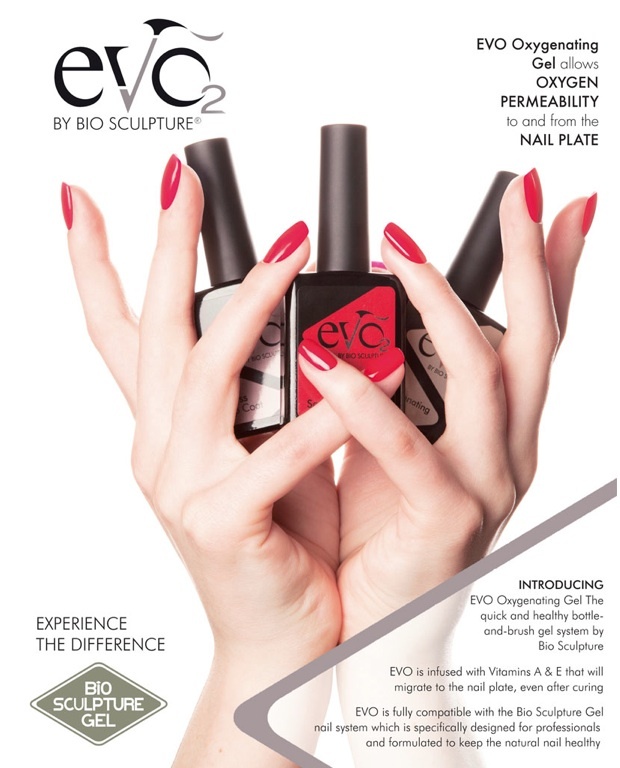 eVo2 is vitamin infused, once the base gel is cured it continues to infuse vitamin A and vitamin E onto the nail surface, your nail continues to stay healthy throughout. This breakthrough technology helps prevent dehydration and softening of keratin, and aids in protecting the natural nail from damage. A revolutionary oxygenating gel technology is designed to improve nail health. What is oxygenating gel? When our base gel is cured it enables the transfer (as it would if their where no gel on your nail plate) of water vapour and oxygen to continue maintaining a healthy nail plate. GO eVo2 its an amazing product that everyone must try and fall in love with. Get the best nail manicure with eVo2 at the best nail salon and best nail technician on the Northern Beaches in Mona Vale.